Paying For College – A Success Story! Cody Bowles, a 2016 graduate of George Mason University, recalls how hard it was to even think about paying for college when he attended Lee-Davis High School. “It was daunting,” he says. Neither of Bowles’ parents attended college, but his mother and grandfather encouraged him to focus on his education, even though they could offer little in the way of financial support. And Bowles wanted a college degree. He reached out for assistance, finding much of it from an advisor with GRASP, a nonprofit agency launched in 1983 to help high school students (and their families) navigate the college process, including the financial piece. Bowles says he met with his school’s GRASP advisor, Anne Michie, many times. “Financial resources are just half of it – so much of it is knowledge,” he says. 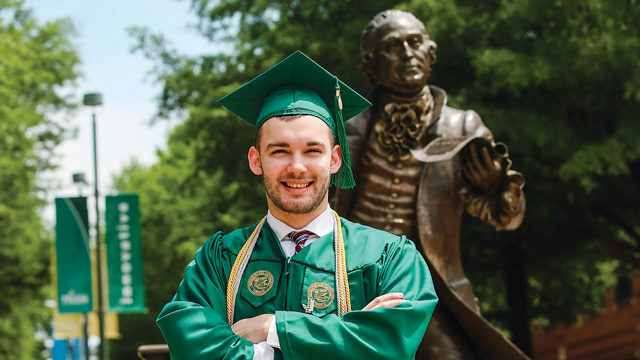 In the end, Bowles started at VCU, but after a successful first year, transferred to GMU because he received even better scholarships in addition to state and federal grants. Now a program assistant for the National Science Foundation in Washington, D.C., he has roughly $12,000 in debt, which would have been higher, but for the twenty to thirty hours a week he put in at Starbucks while he was in college. GRASP advisors meet with students at their home high schools and help them fill out the FAFSA (the federally required financial aid form), identify scholarship opportunities, or seek out available governmental funding, such as Pell Grants. Buckley says a GRASP advisor’s goal is to help students be realistic about their options and develop a plan of attack. “You have to think about what’s right for you,” she says, noting that community colleges can be a stepping-stone to a 4-year degree. “If you want to go to UVA, you can transfer and still get a diploma that says UVA,” she says. In Virginia, twenty-three community colleges offer courses on forty campuses statewide, with Reynolds Community College and John Tyler Community College serving much of the Richmond area. Jeffrey Kraus, assistant vice chancellor for strategic communications for the Virginia community college system, says it’s the goal of every community college to make education accessible for all. “We pride ourselves on affordability; that’s part of our mission,” he says. As with other state-supported schools, community colleges receive funding from the General Assembly and the federal government. The cost of tuition and mandatory fees for community colleges, however, can be one-third of the costs found at a 4-year university. “At a community college, your pocket- book isn’t supporting the football and basketball teams,” Kraus says, noting that typical 4-year universities offer housing and dining options – some of them upscale – that add to the overall cost. If a student really wants the traditional 4-year college experience, there’s still hope. While federal and state assistance is available at state universities, independent colleges – private, not-for-profit – may offer additional funding, especially if the institution has a large private endowment. In Virginia, the University of Richmond and Washington & Lee University commit to meeting 100 percent of a student’s demonstrated financial need (as established by the FAFSA), as well as need-blind admissions. This means a student’s ability to pay won’t factor into the decision to accept an applicant. According to Hartley, the facts are telling. Students are twice as likely to receive financial aid at private colleges than they are at public schools; the amount of aid received is usually three times the amount that would be offered at a public school; and students at private colleges are more likely to graduate on time than students at large public institutions. Though Bowles acknowledges he barely knew where to begin, he was determined to attend a 4-year college. “As cheesy as it sounds, I’ve always been told that a degree is the gateway to the middle class,” he says. Fittingly, Bowles has shared what he has learned about paying for college with his younger sister, Taylor, a 2015 graduate of King William High School. She’s now a junior in the business school at VCU. Previous articleIs It a Smoothie Kind of Day?